Professor Henry “Indiana” Jones, Jr.
On this date “Indiana Jones – The Raiders of the Lost Ark” premiered on June 1, 1981. So, in this post I will discuss Indiana Jones and the inspiration behind the iconic movie character. Then, I will discuss the various elements of the Indiana Jones story and important pieces of his costume; such as his leather jacket, fedora and the whip. Finally, I will end with a brief synopsis of the each of the four Indiana Jones movies. George Lucas, the American film director, producer and screenwriter of the successful “Star Wars” movie franchise is also responsible for creating the character of Indiana Jones. It was while vacationing in Hawaii with his friend and fellow filmmaker Steven Spielberg at the time of the release of the first Star Wars movie that they discussed possible ideas for their next film. They both fondly remembered from their childhood the old short-film serials and popular books about action/adventure heroes … and the character of Indiana Jones was created! It seems that the character of Indiana Jones lives in two very different worlds. The first was centered on a campus where he wears the conservative tweed suit of a college professor, even wearing a pair of glasses to add to his scholarly look. Indy would teach classes filled with adoring female students and he would give lectures on ancient civilizations as part of his archaeology courses. On breaks from his life as a college professor, Indy would travel to distant places in South America, the Middle East or Europe where he would search of various historical treasures. At these times Indy would dress in an entirely different way more suitable to the site of the archaeology digs. He wore a khaki shirt with two large pockets on the front and brown wool and twill pants (made by the film costume department and inspired by a pair of World War II Army officer trousers known as “Pinks”) Indy wore sturdy Alden boots (a personal preference of Harrison Ford) and he also carried a satchel similar to a Mark VII gas mask bag used by the British during World War II. 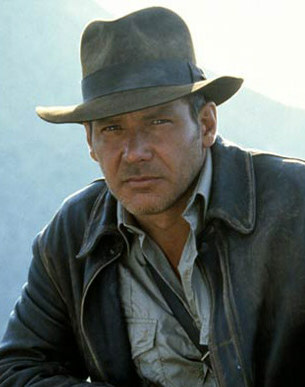 Perhaps the most iconic items of Indy’s clothing were the leather jacket and his fedora. The first item was a leather jacket which was inspired by the American fighter pilots of the 1930s. The Wested Leather Co. of London made the original “Raiders of the Lost Ark” lambskin jacket; later the movie costume department “distressed” the jacket to give it an aged appearance. 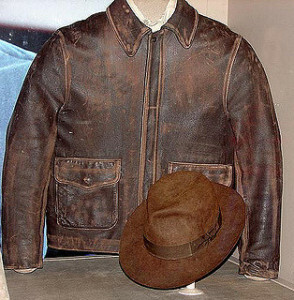 Several additional jackets were used for the three other Indiana Jones films and they were made of more durable cowskin. The second iconic item was Indiana Jones’ fedora, for the first three films the hats were made by Herbert Johnson Hatters of England and for the fourth film the hat was made by the Adventurbilt Hat Company of Columbus, Mississippi. The Indiana Jones fedora features a board brimmed brown hat of the 1930s which was probably better suited to be worn in an urban setting rather than the site of an archaeological dig. The original hat featured a pinched front and a tall crown but for the other three films the hat became more tapered and had a shorter crown. Somehow, through all of Indy’s adventures in the movies whenever his hat is knocked off he always seems to recover! 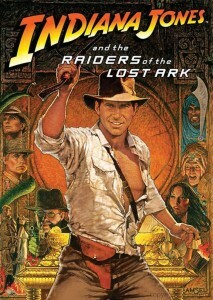 Raiders of the Lost Ark was released in 1981, it was directed by Steven Spielberg with a story by George Lucas. 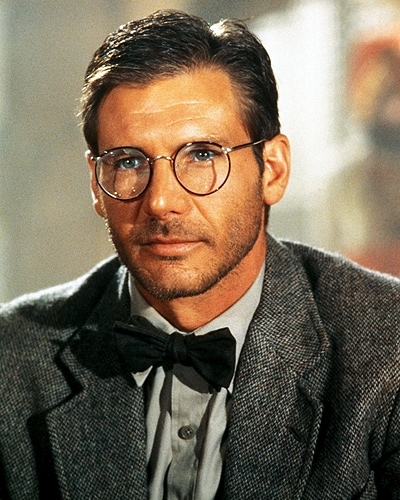 The cast included Harrison Ford as Indiana Jones, Karen Allen as Marion Ravenwood, John Rhys-Davies as Salljah, Denholm Elliott as Dr. Marcus Brody and Paul Reeman as Dr. Rene Belloq. The story takes place in 1936 and begins in the jungle of Peru where Indiana Jones is in the search of archaeological treasures and encounters his rival named Rene Belloq. Later, Indy returns to his job as professor at Marshall College which is located near the museum of his friend, Dr. Marcus Brody. 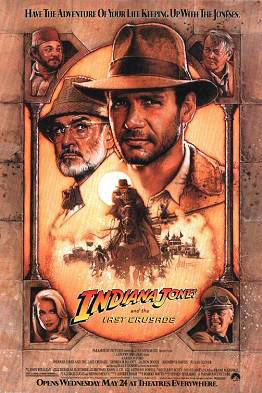 Shortly after arriving back in the United States Indy is visited by Army intelligence agents who request his help against the German Nazis who are searching for an item owned by Abner Ravenwood, Indy’s former mentor, which would help them in recovering the mysterious Ark of the Covenant. His friend, Dr. Marcus Brody, who is the curator the local museum, encourages Indy to take up the challenge. 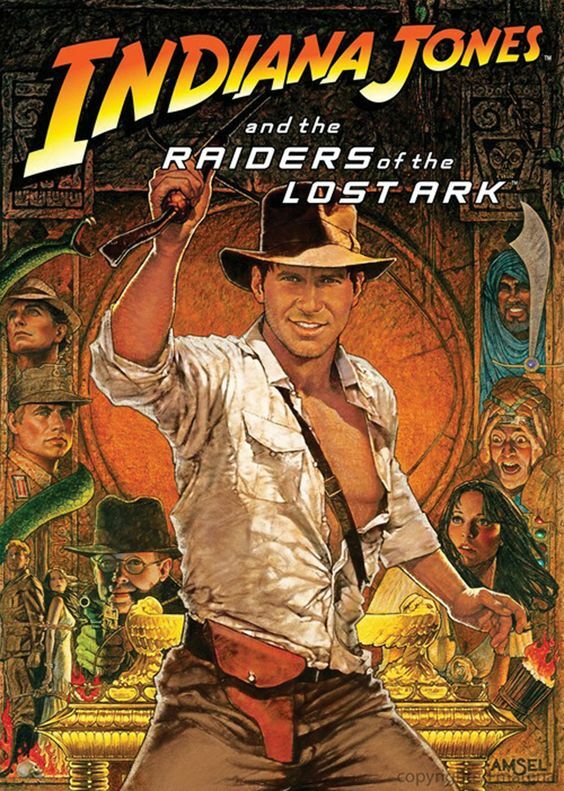 With the aid of Marion Ravenwood and Salljah they follow the clues and eventually find the Ark only to lose it to the Nazis who are led by Belloq. The Ark is finally recovered and at the end of the movie we see it being moved into a large warehouse to be stored indefinitely by the U.S. government. 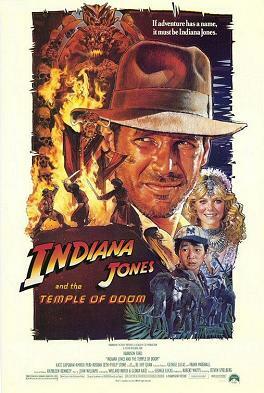 The Temple of Doom was released in 1984, it was directed by Steven Spielberg with a story by George Lucas. The cast included Harrison Ford as Indiana Jones, Kate Capshaw as “Willie” Scott, Jonathan Ke Quan as “Short Round” and Amrish Puri as Mola Ram. The movie begins in 1912 with a young Indian Jones who is on a Boy Scout expedition in Utah and literally stumbles onto a group attempting to steal some ancient treasures. 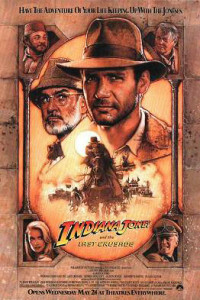 Indy thinking that the Cross of Coronado belongs in a museum steals the treasure and as a result is chased by the men. It is this part of the story that explains many of the elements of Indy’s character because as he is being chased he tries to escape on a passing circus train where he lands in a crate of snakes (prompting his fear of snakes), then in the car holding the lions Indy uses a bullwhip to protect himself (by incorrectly using the whip, it causes a cut on his chin which explains his scar) and finally as the men catch up to him and recover the ancient relic, the leader of the group rewards Indy’s bravery by giving him his hat (which becomes the iconic Indiana Jones fedora). We also learn to offer things about Indy, first that his malamute dog is named Indiana (the real origin of his nickname) and secondly the Cross of Coronado sparks his interest in finding other lost treasures and an eventually career in archaeology. 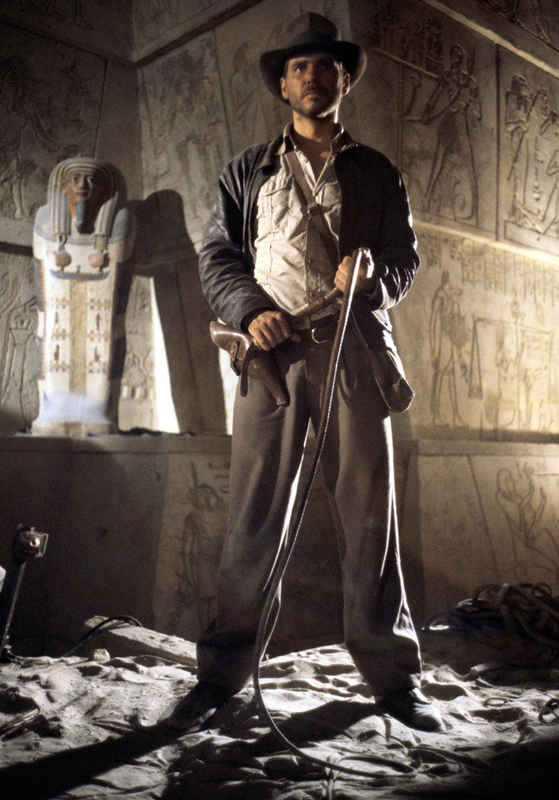 Then, the movie moves forward in time to 1938 as an adult Indy finally recovers the Cross of Coronado in his quest to have the ancient relic put into a museum. As Indy returns home, the Coronado’s Cross in given to the museum where his friend Marcus Brody is a curator. Later, Indy finds out that his long estranged father, Henry Jones Sr., has vanished during his search for the Holy Grail. Strangely, a package from Indy’s father arrives in the mail, it is Henry the notebook which contains the glue he has gathered in his search for the Grail. Indy and Brody leave for Venice to search for Indy’s father and to meet Elsa Schneider who was assisting him at the time of his disappearance. 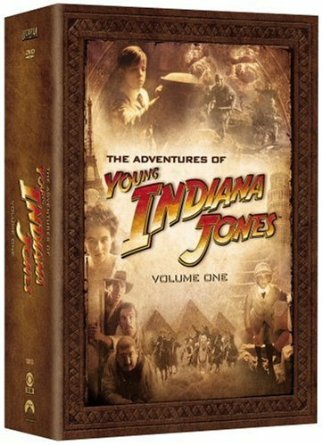 Ultimately, Indy finds his father who is being held by the Nazis in a castle on the border of Austria and Germany. As, it turns out Elsa was working with the Nazis and steals the Grail notebook that Indy’s father had sent to him for safe keeping. With a brief detour to Berlin and a face to face meeting with Adolf Hitler, Indy recovers the notebook. After gaining additional clues with the aid of his old friend, Sallah, it leads them to the hidden temple where the Nazis catch up to them. In the end, the Holy Grail is found, the Nazis are killed as the temple collapses, Indy, his father and friends barely escape and the movie ends with them riding off into the sunset! The Kingdom of the Crystal Skull was released in 2008, it was directed by Steven Spielberg with a story by George Lucas. 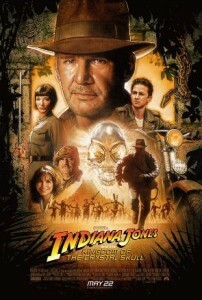 The cast included Harrison Ford as Indiana Jones, Karen Allen returns in her role as Marion Ravenwood, Kate Blanchett plays a Soviet agent named Irina Spalko, John Hurt as Harold “Ox” Oxley and Shia LeBeouf plays Mutt Williams who is revealed during the movie to be the son of Indy and Marion, also known as Henry Jones III. The movie is set in 1957 and begins in a secret location in the Nevada dessert. Soviet agents led by Irina Spalko are accompanied by Indiana Jones as they break into a U.S. Government warehouse (could it possibly be the same facility where they stored the Ark of the Covenant over 20 years earlier?) to find an alien corpse with a mysterious crystal skull. The Soviets are unsuccessful and Indy escapes only to get caught in the middle of an atomic bomb test, he survives the nuclear blast by climbing into a lead-lined refrigerator and is rescued by the FBI who suspect that he is working with the Soviets. Indy returns to Marshall College but is forced to take a leave of absence until he can be cleared of any involvement with the Soviets. At this time, it is revealed that both Indy’s father, Henry Jones Sr., and also Indy’s friend, Marcus Brody, have died. Then, a young man named Mutt Williams finds Indy and tells him that he knows a man, Harold Oxley, that has found another crystal skull in the jungles of Peru but he has recently suffered a mental breakdown and disappeared so he is asking Indy’s help in finding him. When Indy and Mutt arrive in South America it was Marion Ravenwood, Indy’s former love, that has sent for him but that the only surprising thing. In a unexpected twist of the story we learn that Mutt is actually the son of both Marion and Indy! As the story progresses, they eventually find “Ox” who is being held by Irina and the Soviets that are still searching for the crystal skull. As the story comes to a dramatic conclusion the legend of the crystal skull and the connections to aliens is finally revealed. The movie comes to a happy end when Indy and Marion are married … and they live happily ever after!! But wait, the story of Indiana Jones is not over! Throughout the years, rumors of another Indiana Jones movie have been speculated and in March 2016 it was officially announced that there will be a fifth Indiana Jones movie which is currently in development with a possible release date of July 2019.